Events from the year 1934 in the United States. January 26 – The Apollo Theater opens in Harlem, New York City. January 27 – Albert Einstein visits the White House. February 22 – Frank Capra's It Happened One Night, starring Clark Gable and Claudette Colbert, is released. It becomes a smash hit and the first of Capra's great screen classics. It becomes the first film to win all 5 of the major Academy Awards – Best Actor, Best Actress, Best Screenplay, Best Director, and Best Picture. Gable and Colbert receive their only Oscars for this film. March 3 – John Dillinger escapes from jail in Crown Point, Indiana, using a wooden pistol. March 12 – The 6.5 Mw Hansel Valley earthquake affected a sparsely populated area of northern Utah with a maximum Mercalli intensity of VIII (Severe), causing light damage and two deaths. March 13 – John Dillinger and his gang rob the First National Bank in Mason City, Iowa. March 24 – The Tydings–McDuffie Act comes into effect, establishing the Philippine Commonwealth which allows greater self-government of the Philippines, and scheduling full independence from the U.S. for 1944. Sugar imports are reduced and immigration is limited to 50 Filipino people per year. April 1 – Clyde Barrow and Bonnie Parker kill 2 young highway patrolmen near Grapevine, Texas. The world's highest ever recorded surface wind speed of 230 miles per hour (370 km/h) was recorded on the summit of Mount Washington (New Hampshire). April 22 – John Dillinger and two others shoot their way out of an FBI ambush in northern Wisconsin. May 9 – 1934 West Coast waterfront strike: A general strike is engaged in San Francisco. May 11 – Dust Bowl: A strong 2-day dust storm removes massive amounts of Great Plains topsoil in one of the worst dust storms of the Dust Bowl. May 15 – The United States Department of Justice offers a $25,000 reward for John Dillinger. May 16 – Teamsters in Minneapolis begin a strike that lasts until a settlement proposal is accepted on August 21. A team of police officers, led by Texas Ranger Frank Hamer, ambush bank robbers Bonnie Parker and Clyde Barrow near their hide-out in Black Lake, Louisiana, killing them both. The "Battle of Toledo" begins during the Auto-Lite strike in Toledo, Ohio, continuing until May 27. June 6 – New Deal: U.S. President Franklin D. Roosevelt signs the Securities Exchange Act into law, establishing the U.S. Securities and Exchange Commission. June 18 – Pub.L. 73–394 expands the crime of making false statements to remove the requirement of an intent to defraud and expands the coverage to "any matter within the jurisdiction" of the federal government. The world-famous Brookfield Zoo opens in Brookfield, Illinois. The Hays Office censorship code for motion pictures goes into full effect in the United States. July 17 – The North Dakota Supreme Court declares Lieutenant Governor Ole H. Olson the legitimate governor and tells William Langer to resign. Langer proceeds to declare North Dakota independent. He revokes the declaration after the Supreme Court justices meet him. July 22 – Outside Chicago's Biograph Theatre, "Public Enemy No. 1" John Dillinger is mortally wounded by FBI agents. August 15 – The United States occupation of Haiti ends as the last Marines depart. August 19 – The first All-American Soap Box Derby is held in Dayton, Ohio. 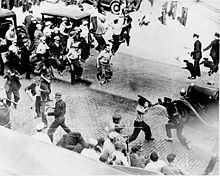 August 25 – Anti-union vigilantes seize the town of McGuffey, Ohio, during the Hardin County onion pickers strike. September 8 – Off the New Jersey coast, a fire aboard the passenger liner Morro Castle kills 134 people. September 29–October – Folk song collector John Lomax makes the first recordings of "Rock Island Line" at prison farms in Arkansas. October 22 – "Pretty Boy" Floyd is shot and killed by FBI agents near East Liverpool, Ohio. November 5 – Kelayres massacre: An election-eve rally by Democrats in the coal-mining village of Kelayres, Pennsylvania is fired on as it passes the home of a leading local Republican family, resulting in 5 deaths. November 20–21 – Business Plot: An alleged coup to overthrow President Franklin D. Roosevelt is investigated by the McCormack–Dickstein Committee and is reported by the Philadelphia Record. November 21 – Cole Porter's musical Anything Goes, starring Ethel Merman, premieres in New York City. November 26 – Universal Pictures releases the first film version of Fannie Hurst's novel, Imitation of Life, starring Claudette Colbert and Louise Beavers. It gives Beavers, usually featured in small roles as a maid, her best screen role, and features the largest supporting role played by a black person in a Hollywood film up until then. Its storyline is extremely daring for a 1934 film – part of it revolves around a young mulatto girl rejecting her mother and trying to "pass for white". It is the first Hollywood film to seriously deal with this subject. The 1936 film version of Show Boat, also from Universal, will deal with a similar storyline. November 27 – A running gun battle between FBI agents and bank robber Baby Face Nelson results in the death of one FBI agent and the mortal wounding of special agent Samuel P. Cowley, who was still able to mortally wound Nelson. December 26 – An American Airlines aircraft crashes in the Adirondack Mountains. December 29 – Japan renounces the Washington Naval Treaty of 1922 and the London Naval Treaty of 1930. National Union for Social Justice (organization) founded. ^ "Milestones of the U.S. Archival Profession and the National Archives, 1800-2011". U.S. National Archives and Records Administration. Retrieved 24 August 2016. ^ "Riding the Rails: Timeline of the Great Depression". American Experience. USA: Public Broadcasting Service. Retrieved 24 August 2016. This page was last edited on 27 December 2018, at 19:24 (UTC).